Unfortunately, some times when we initially accept salvation, we expect to live a pretty easy life receiving blessing after blessing. I mean, how dare we go through challenges and difficulties as children of the Most High God?? Well I am sorry to break to you, but it is pretty much a guarantee that as Christians we will go through STORMS of all kinds! We are not exempt from any of them. As long as we keep living, there will come a day when a difficult situation will happen that we never saw coming.. whether it be financially, health-wise, employment, or any kind of life changing situation. For me, 2014 has been draped with storms of different kinds, but luckily this go round I have grown stronger in the Lord and what would have made me tap into a deep depression a few years ago when I was not living for God, has challenged me to call on Him and trust Him with every fiber of my being. 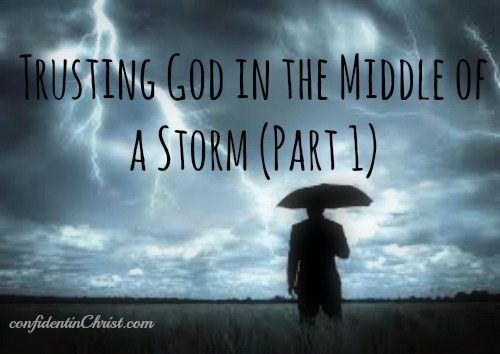 Honestly, there are still some major storms in my life happening as I type this, but I want to share with you how I am able to trust God in the midst of it all. The Bible says that everyone saved and unsaved will go through good times and hard times. The only difference is that those who don’t know Christ do not have any hope. They do not have any rock to stand firm on. I can not imagine living life without God, because it is simply too hard. We as human beings, just do not have the power to handle it with our own strength. God never equipped us to have that much strength. Despite what may have been inferred, God never promised us an easy life after salvation. Sometimes life gets even more difficult once we become saved because we are now a threat to the enemy. So Satan comes after us even harder than before. I am a living witness to this… It seems as soon as I got serious about my relationship with God, I was being hit with one storm after another. This may be a tactic by the enemy to lure you back away from God and lie to you that being a Christian is not worth it, but the DEVIL is a LIE! God did not send Jesus Christ to die on the cross for us to continue to try to figure everything out on our own. God cares so much for us that He wants us to give him every burden of our life. He said He can carry all of our cares, including the storms we go through, so that we do not have to. Even though it is extremely hard to do because we feel like if we do not fix it then who will? However, there is no storm we are going through, have gone through, or will go through that is a surprise to God. So there is nothing He can not handle, all He asks is that we give the situation or circumstance over to Him. Even though for the most part, storms last way longer than we want them to, God know what you can handle. He may want you to go through it and hit rock bottom so that all you have left to rely on is Him. Then in the 12th hour, He comes through and quiets the storms and brings the sunshine. When it is over, He gets the praise and glory He deserves, because you know it had nothing to do with you and everything to do with Him. Your storm has an expiration date. It is temporary. It will not last forever. Go through it knowing that each day you are getting closer to it coming to an end.